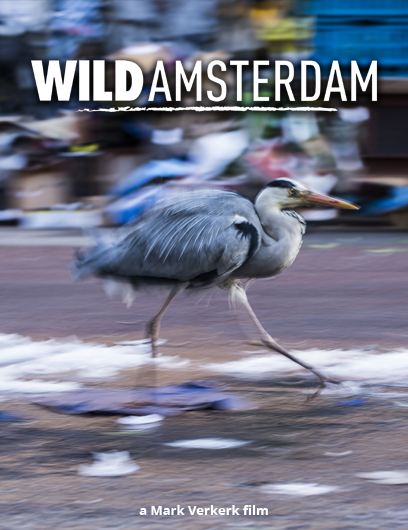 Wild Amsterdam paints a picture of the city from a completely new perspective, that of the unnoticed inhabitants: the many wild animals and plants. Mountain ranges made of glass and concrete, industrial savannah’s, miles of sewer pipes. For a large number of wild animals, trees and plants, our streets, tunnels, waterways and brick buildings are just as suitable and attractive as a primeval forest or new wilderness. The city does not repress or replace nature, it is nature. The French black-footed gull and the vinex fox are just as wild and special as the seal and the panda. EMS FILMS, once more under the direction of Mark Verkerk, worked on the third part in the trilogy about Dutch nature. After a classic four-season cycle of life film and an epic story about dynamic nature in our country, now there is Wild Amsterdam: a cinema film that connects exciting scripted scenes with surprising documentary images of urban nature. A city film that shows the dynamics, speed, power, beauty and humor of nature in an urban environment with surprising plot twists. A compelling story full of adventurous encounters between animals and people. The style of the film is dynamic from the point of view of the animals, the people and the city are the ‘decor’. In the form of a mosaic film in which several stories within the city play on the basis of one or more characters (animals) that touch each other casually or directly. The main location is the Amsterdam city center with trips to the port area, IJburg, the southern-axis or a trip to the Arnhem sewer as an underground film set. 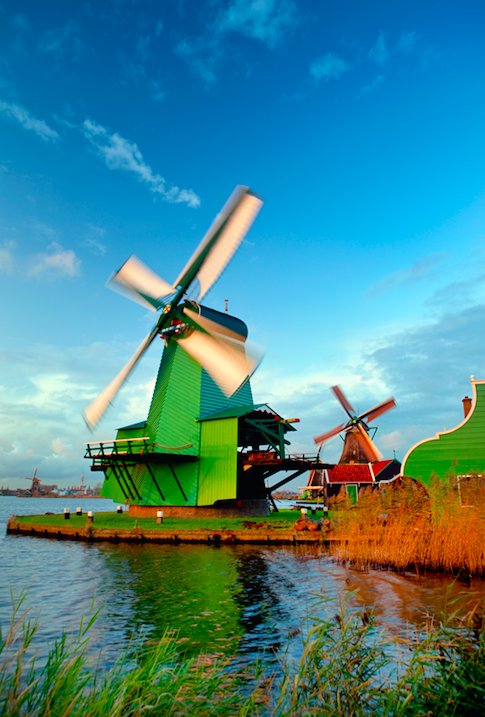 THIS IS HOLLAND uses the latest technology to make you feel like you’re flying. With breathtaking film images projected on a huge spherical screen and additional special effects, you discover the Netherlands in a spectacular way! With 40 people at the same time you hang in the spherical screen, while you can let your hands and feet dangle freely. The 9-minute Flight Experience takes you on an adventure through 22 authentic locations in the Netherlands and offers you a unique perspective from the air. Your chair moves with the film that takes you for 9 minutes on a breathtaking journey through many beautiful places of our country. With special effects like wind, fog and smells, it really seems like you are floating through the air, crossing dikes and braving storms. From the air you fly right along the world famous Zaanse Schans, the Delta Works and special UNESCO World Heritage sites. The makers of ‘De Nieuwe Wildernis’ have collected the most unique images from the Netherlands on behalf of THIS IS HOLLAND. With a special camera, attached at the bottom of a helicopter, they showed the most special locations. 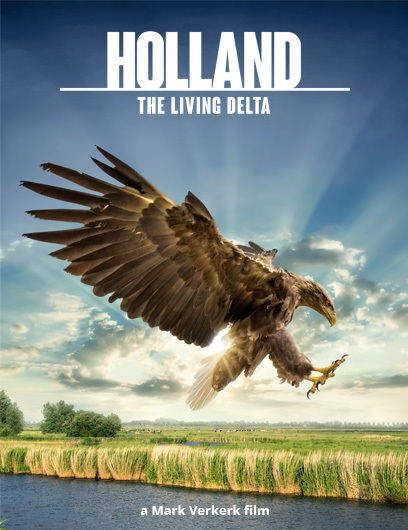 Holland, The Living Delta is a (re)discovery of the Netherlands. An ode to our rivers, coastal areas and the rich nature that they bring to our delta, in all strength, riddles and beauty. After the overwhelming success of The New Wilderness, the film’s makers now come with the spectacular second part that is narrated by Bram van der Vlugt and Carice van Houten. It is a film that will show us, like never before, the dynamism and resilience of the country in which we live. The film Holland will fascinate by the highest quality nature photography and use the most modern techniques. The story of the nature film is told from a cultural-historical context and seen from the perspective of main characters such as the bald eagle, beaver, hare, pimpernel blue and stickleback. Cameras and sound people from home and abroad, from highly experienced to up-and-coming talent, will, just like The New Wilderness, make Holland stand out through the highest quality of image. The sea eagle settles in a high tree on the river. Here the source of life flows for everything the sea eagle knows. But he barely recognizes her because he has not been here for hundreds of years; everything is different now. The story of the film is a rediscovery of the Netherlands. Internationally a showcase of the Dutch identity: naturalists and water managers. In one of the world’s most densely populated countries, a nature reserve of international allure has developed: the Oostvaardersplassen. Here nature determines the rhythm. For two years, a number of film teams followed the foxes, geese, kingfishers, deer and the largest herd of wild horses in Europe. EMS FILMS has received exclusive permission to show all seasons in the Oostvaardersplassen. 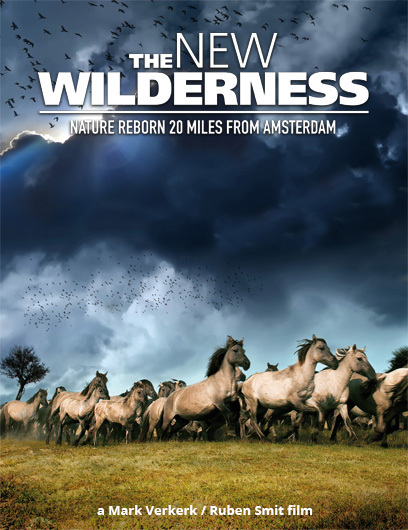 The result is a nature film such as never before made in the Netherlands. The expressive konik horses throw their foals between the calves of the majestic red deer and heck cattle. An abundance of new life tries to conquer new territories with spectacular battles. It is a place that forms a paradise in spring and summer, but in the winter a grim landscape. There is less food so that the inhabitants of the grasslands and swamps have to make choices that are of vital importance. The New Wilderness is a natural spectacle for the whole family. The ‘circle of life’ or ‘cycle of life’ in the Oostvaardersplassen is beautifully portrayed. Sometimes poignant but also humorous and endearing.